SAN JOSE, Calif. – The game ended. Oregon 16. Down the Nets, headed to another Sweet 16. And if you had told the Ducks players that they would pull together a splintered mess in such a wonderful fashion they'd called you a liar. 1; aka "World Wide Wes" – took a seat just behind Oregon's bench, Section 128. was surrounded by UO fundraisers, employees, families of players, and a couple of Nike executives. Friends and family section, for sure. Nike founder Phil and nothing says you're a hot commodity in the NCAA like Wesley showing up to you. On the Super Bowl sideline with the Dallas Cowboys. "Everybody," the gifted and talented athletes used to say, "knows World Wide West." 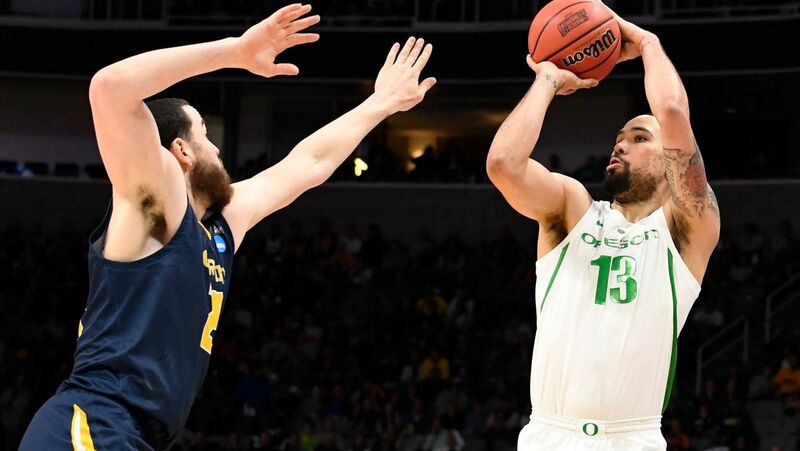 Oregon's length and athleticism was too much for UC Irvine on Sunday. won the game halfway through the end of the second half, giving the anteater credit. "They are coming from the locker room, with coach Russell Turner counting them," Good enough is not good enough. " Then , the anteaters run on a 14-0 run, and took the lead. Said Ducks' coach Dana Altman: "We were a little stuck in the mud." But if this tournament is known for anything, it's known for moments in which talented, athletic teams remind less talent ed, less-athletic teams when it's time to go home. And blocked blocked by blocked shot, basket by basket, stop by stop, Oregon pointed UC Irvine toward Oakland International Airport. A decade ago, Wesley was a fixture at Oregon basketball games. He was close friends with Ducks assistant Kenny Payne, and tight with Malik Hairston, a six-foot-six McDonald's All-American from Detroit who famously picked the Ducks over Michigan and Oklahoma. Wesley once why Hairston chose moving to Oregon over staying in his home state. Wesley told me, "Terrorism is less of a threat." Truth is the country's top high school talent always seemed to follow Wesley. Payne eventually left Oregon for Kentucky to be Calipari's chief recruiter. Hairston became an NBA Draft pick. And Wesley took a job as a "consultant" with Creative Artists Agency. But before that, the Ducks reached the 2007 Elite Eight. So it was a full-circle moment with Wesley back around the Ducks, clapping for freshman Louis King and rising to his feet when sophomore Kenny Wooten dunked an alley-open. Freshman Bol Bol, in the way in street clothes, looked delighted with his team advancing. All the while, I can't help but wonder which in that trio the power brokering Wesley knows best. Or who might show up in an Oregon uniform next. Normally, you see a team loaded with young, promising talent, and you're wondering what it might become in a couple of years. But with this group, in this era of Oregon basketball, it's a seize-the-moment feeling. This window of opportunity is fleeting and the Ducks climbed through it on Sunday. 1 seed in the Louisville Regional. Again, if you're a duck you have to be delighted at where this season has taken you. If you're a Ducks player, you might pinch yourself. Oregon is back in Sweet 16, with "World Wide West" hanging around again. Not sure Oregon is good enough to beat the Cavaliers. Then again, until UO reeled off 10 straight victories, who believed in the Ducks? And now wouldn't want to see them take a swing at top-seed Virginia's jaw, just to see if it's made of glass. I'll watch. You will too. They've been drawn in the world again.